It will soon be the end of another special year on-board the mighty TRUE NORTH. And what better way to recap than with stories from our much-loved cruise directors. 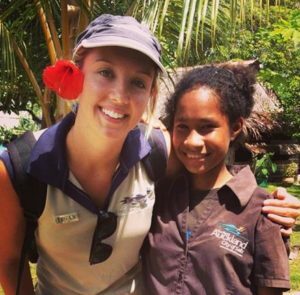 Here Marese and Tegan recount experiences made possible by the generosity of guests and crew alike. "During one of our Sepik Soirees we made a first-time visit to Loaua Village on the island of Little Massau. When we landed on the island we were welcomed by friendly happy people. They were excited to show us around and showered us with gifts like coconuts, watermelon, chillis, eggplant and pineapples. They also explained that for the past 2 years they had been building a new church and that they had raised the monies required without any external help. When our guests saw the church and heard stories of the villagers building it by hand they were very impressed and, when we returned to the TRUE NORTH we raised 1,500 kina to help with the cost of completion. When we went back to the village with our donation it was a joy to see the looks of surprise and appreciation. Next year we will be excited to see the finished project! On behalf of everyone at North Star Cruises Australia, I wish you all a safe and Merry Christmas!" Pictured above: Marese with some of the children who live on Little Massau. 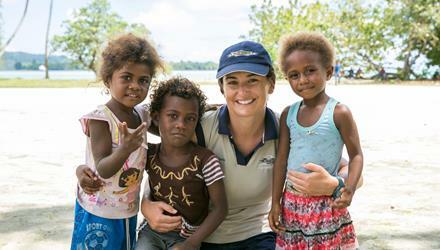 "During my 6 years on-board the TRUE NORTH, I have been fortunate to visit many villages in PNG. I’ve had so many special experiences but there is one village that has touched my heart a bit more than the others. I first visited Luf Island in 2012 and this was when I first met my friend Sonya. I remember that day well, arriving onto the island's white sandy beach and feeling overwhelmed by the number of children running towards our expedition boats. We were welcomed with a sing-sing and during the performance Sonya approached me and took my hand. She then very proudly began showing me around her village. We chatted about her family, her school and her favourite hobbies - playing soccer and gardening. Since that day - I have spent time with Sonya each time the TRUE NORTH has visited Luf Island. When we arrive Sonya runs along the beach calling my name whilst the other children call out ‘True North, True North.’ Our friendship has developed through conversation and stories from two completely different lives. Sonya and I always exchange small gifts however the generosity of our guests has enabled much bigger donations of school supplies, sporting equipment and medical supplies. Witnessing the gratitude of Sonya’s fellow villagers is very much part of the TRUE NORTH experience. I wish everybody a successful, happy and exciting Christmas and New Year!" To arrange the best holiday that you have ever had - contact your preferred travel representative or your adventure partners at North Star Cruises on +61 8 9192 1829! See you on the TRUE NORTH!